This month I’m headed to gorgeous country of Japan to experience, and soak in, their local culture, eat my way from Tokyo to Kyoto and learn all their beauty secrets! Japan is famously known for their single portion take-out or home-packed meals, otherwise known as bento boxes. 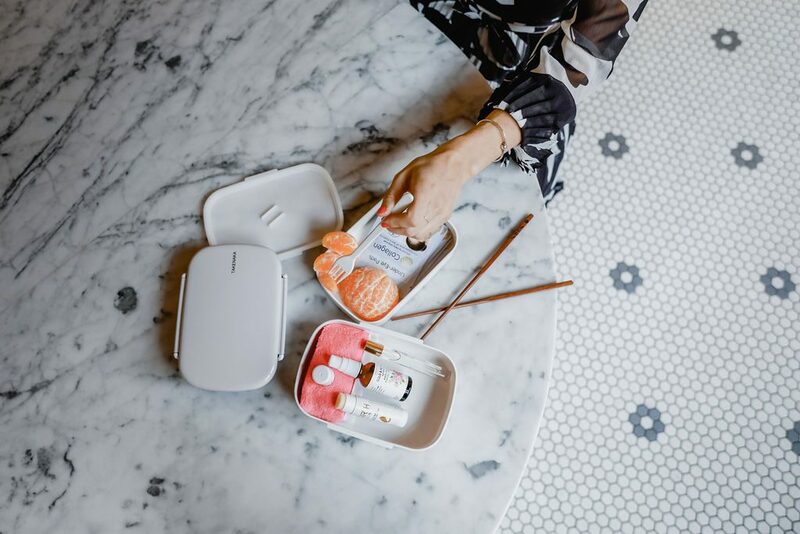 Today I’m putting a twist on the traditional Japanese meal and filling my bento box with the beauty products for my travels to make a beauty bento box! 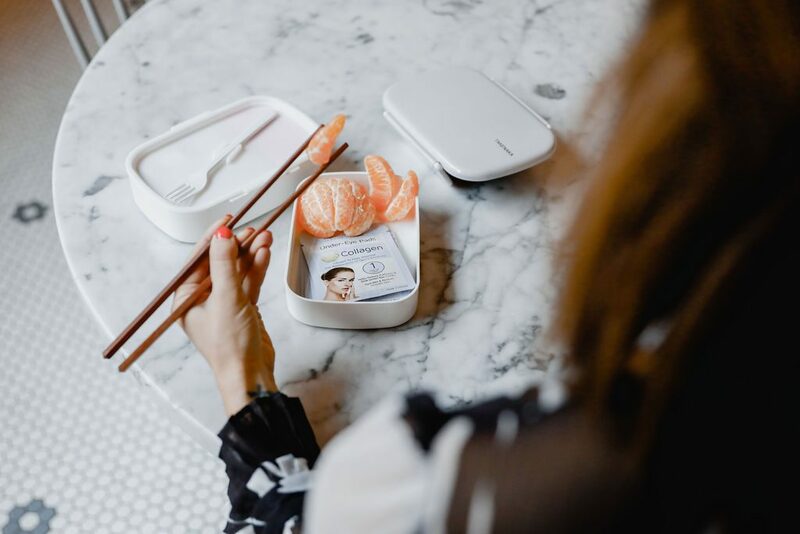 Takenaka is a Japanese company, with minimalistic vibes, that crafts the most beautiful and reusable bento boxes. Their boxes are sleek elevating the way you travel with your food for the everyday! 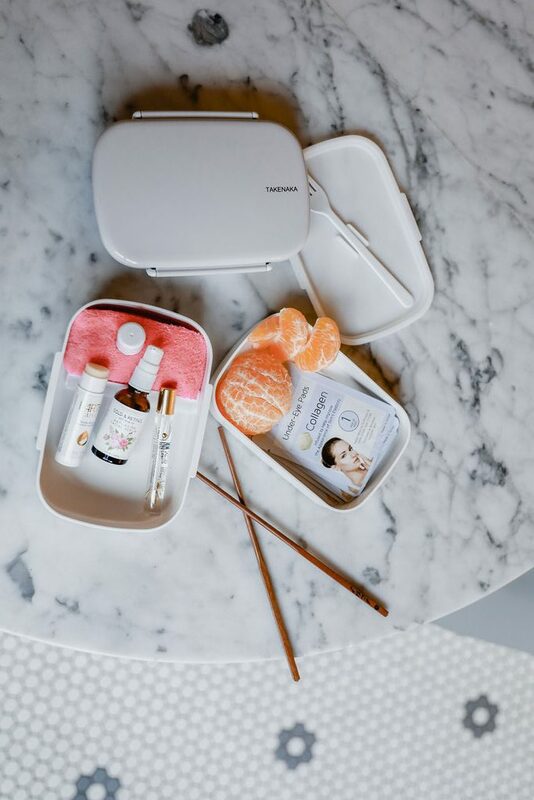 The durability of the box got me thinking, why not use my bento box to store all my in-flight favorites for my trip to Japan! My “take-off” routine involves one major element – HYDRATION! The cabin of an aircraft will pull all the hydration from your body – it’s important to stay hydrated by drinking water and using the right products that will keep your skin hydrated for 10+ hours! First things first, I cleanse my skin. I start with these Precision Beauty Rose + Collagen wipes to clear myself of leftover make-up or product from the morning. The rose and collagen combo in the wipes is game changing – they are incredibly gentle on your skin, all while helping with the appearance of your skin’s elasticity. Following the cleansing wipes, I’ll run half my Elite Magic Make-Up Remover Cloth under cold water and take one more pass at cleansing my skin and use the dry end to prep my skin for product. After the serum has set in my skin, I’ll layer the Earth Luxe Body Balm over the same areas and finish with adding a thin layer on my lips. 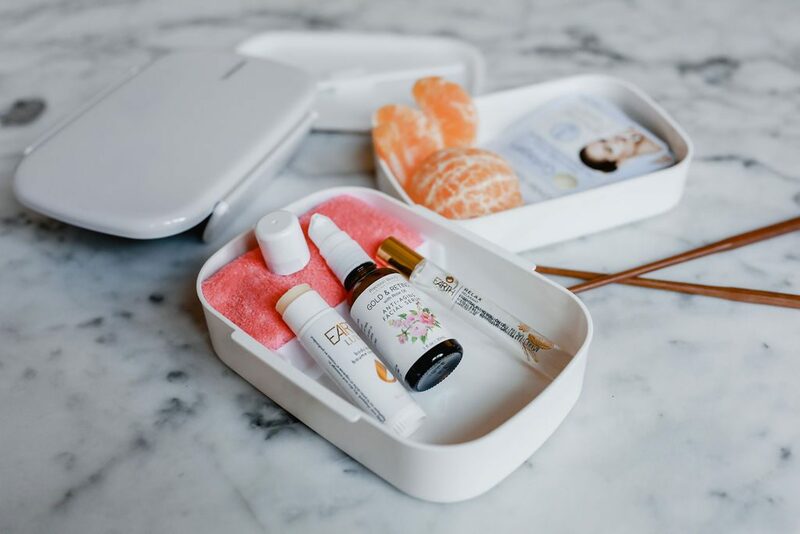 The Earth Luxe Body Balm stick is PERFECT for travel – it’s a compact 3-in-1 product that stows easily in your liquids bag all while giving you multi-functionality! This post was sponsored by The Inspired Home – all thoughts are my own. I liked it very much. The dress suits you very well. I wish I had it. Love the tips! I need to get on a flight routine ASAP! Thanks Boo! It’s crucial to staying hydrated!